EDIT: Please note that there have been recent changes to the Monolith. Specifically, it has been moved to approximately an Astronomical Unit out from Dead End V, Moon 5 (though Moon 5 is still the closest celestial object). A beacon has now been added to the overview to navigate to the Monolith. Finally, Blood Raider cruisers and frigates now congregate near the Monolith. Caution is, as always, advised. Cruising near New Eden, I came across a small, out of the way system known as Dead End. It’s a small, relatively unremarkable system, really, with eight planets. Living up to it’s name, there’s only one way in, and one way out. I almost warped right back out looking at the basic system map, but I felt like there was something out there. After probing for a few moments, nothing came up on the Professor’s scans, or on the scanner probes. Still, I couldn’t quite shake the feeling that someone, or something, was watching me. Judging me. I checked the local comm net, but I was the only ping back from the system router. Regardless, I began warping among the various celestials in the system. Time and again, there was absolutely nothing out there. But why didn’t I feel quite alone? Then, near the fifth moon of the fifth planet, I noticed something in the distance from my warp in points. I immediately directed the Professor’s scanners at it, but it registered as…. nothing. Not just the “nothing” of empty space, but literally nothing. Like my scanners were going right through it. Playing around with my sensors for a few moments, I recalibrated them to take at least the dimensions of it. One thing was immediately apparent: it met a perfect 1:4:9 ratio. Not even a micron off. 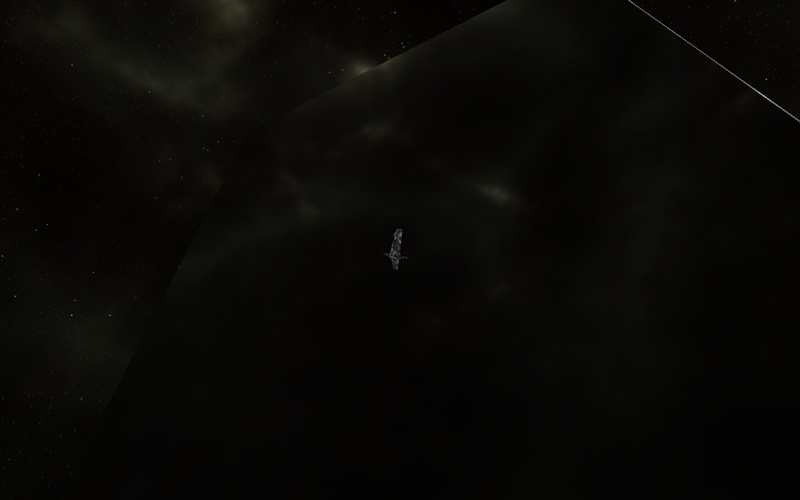 The cool, clean black surface, with nary an impact crater in sight, suggested it might have been dropped into the system just yesterday, but something told me that this dated back to the time of the original Colonizers of New Eden, maybe even further back than that. I approached it, hoping that maybe some of the Professor’s probes could knock off a sample of the material, but to no avail. I managed to lock onto it, at least, but my analyzer couldn’t make heads or tails of it. After a few minutes, I gave up, and resumed my exploration. I couldn’t shake the feeling that, as much as it didn’t seem to react at all to my presence, that something had studied me closely during those brief few moments. With a final shiver, I returned to Central Point, intent on getting back to high sec for the day. Potential Hazards: Getting to Dead End from high sec space requires extensive low sec travel. Pirates (both pod and rat varieties) can be quite common on the route. A covops would be recommended. 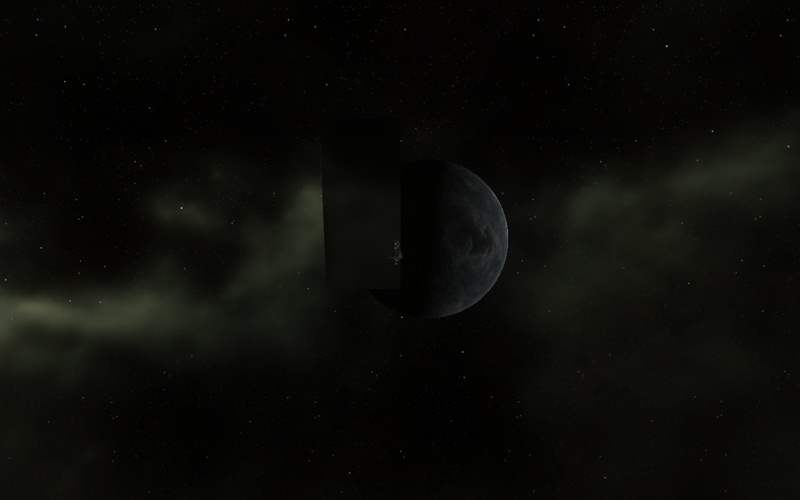 Additional Notes: I’ve heard a number of rumors that a second monolith actually exists in New Eden, and that it jumps around from system to system. I haven’t seen this myself, and so therefore can’t confirm or deny it, but I wanted to pass it along. This entry was posted on December 18, 2009 by mark726. It was filed under Low Sec Sights and was tagged with Easter Egg, Genesis. Thanks so much for putting yourself to the challenge of doing this adventure!!!! It is exciting to read, and I very much intend to refer to your research when I embark on my own adventure!! I’m really digging it dude. And…it’s full of stars? If you info the Monolith IG that’s the description that you get. It’s also what Dave Bowman said when he finally approached the Monolith in Jupiter (Saturn in the books) orbit in 2001: A Space Odyssey. The monolith is obviously a tip of the hat to the book. I found one of these in Danera also. Hmm, that one is getting added to my list then. Haven’t heard of it before, thanks! 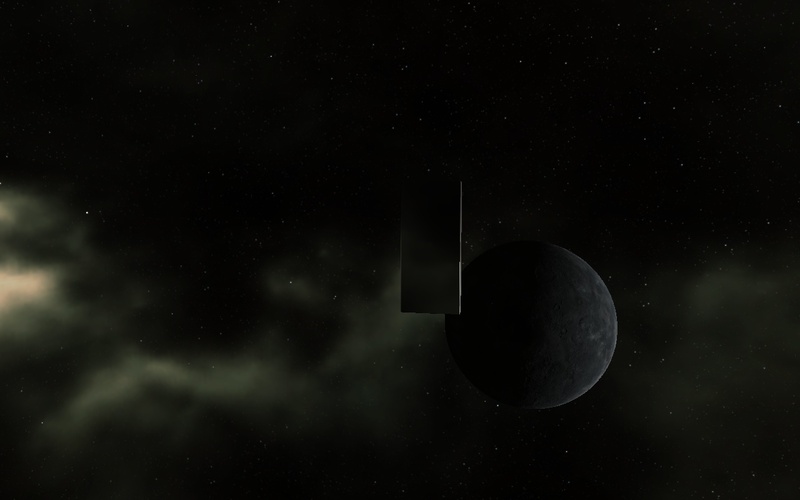 You can find monoliths also randomly around W-space, usually in radar sites. They tend to pop up there quite oft. today i found another monolith on the very center of a relic site named “Ruined Blood Raider Crystal Quarry”. i got on Richard Strauss – Also Sprach Zarathustra, Op. 30 (Opening) [HD] mode XD.